Mumbai University had introduced a new examination pattern for Law students but the Student Law Council expressed their discontent with the pattern and have filed an online petition through change.org. Mumbai University recently made a change in the curriculum of the Law courses and according to which, the new pattern will consist of a 60/40 marking system. Several student organisations came forward to oppose and protest against the new pattern but yet, the University did not make any amendments to the pattern. In response, Student Law Council President Sachin Pawar has filed an online petition through change.org and more than 860 students have agreed to sign the petition to scrap the new pattern. According to the Central University Grants Commission (UGC), Mumbai University introduced rank category system. However, there has been no fixed method for the same as it has been changed several times in the past several years. A few days ago, the University had passed a circular and declared about the introduction of a new pattern. According to the circular, the new 60/40 marking system was introduced for the law students. As per the new marking scheme, students need to secure a minimum 18 marks in the 60-mark examination whereas 12 marks have been set as passing marks in the 40-mark examination. Therefore, there has been a change in the passing method of the Law examinations. 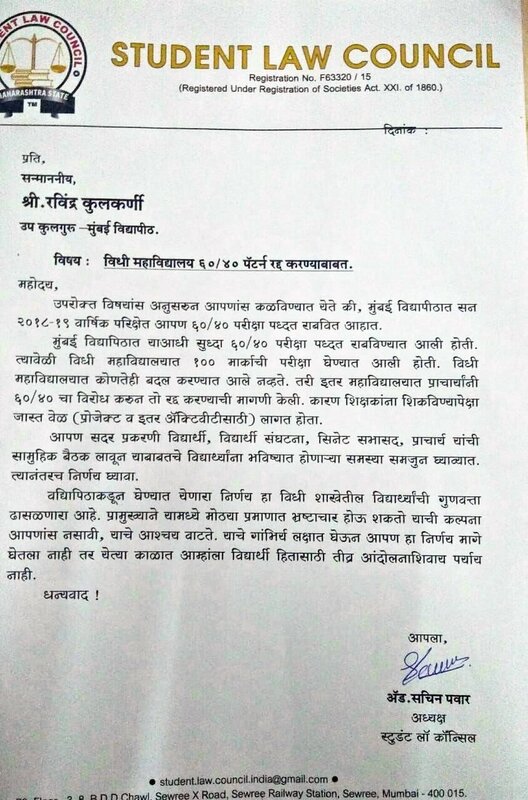 Prior to this, the Law Council had approached Pro-Vice Chancellor Dr. Ravindra Kulkarni who had assured them of forwarding their letters to the authorities for changing the new exam pattern. However, when the students received no reply or change in the curriculum, they filed the online petition. So, Sachin Powar stated that they had received signatures of 868 students and so, they have all demanded that the new examination pattern must be scrapped as it degrades the level of students appearing for Law examinations.